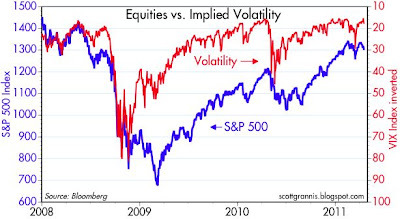 Markets get jittery at times, and when they do it's helpful to review the fundamentals. As the top chart shows, swap spreads haven't budged at all in recent weeks, and are only slightly higher today, despite the headline news to the effect that the official outlook for the U.S. economy has been downgraded by S&P, and Greece is on the cusp of a default (which I anticipated a few months ago, based on the behavior of swap spreads and sovereign debt spreads). 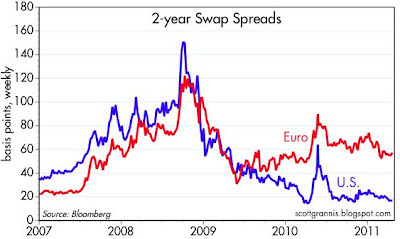 Low and relatively stable swap spreads mean that systemic risk is also low. 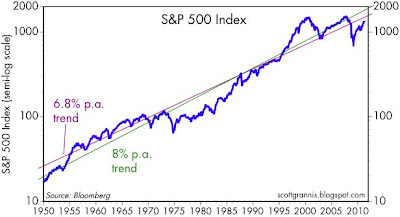 Whatever is going on does not pose a serious threat to the health of the economy, or to the financial markets. Europe is going to have to digest a Greek default, but it shouldn't prove to be the end of the world. As the second chart shows, the Vix index has moved up of late, but it's a pretty minor case of the jitters when looked at in the context of the past few years. 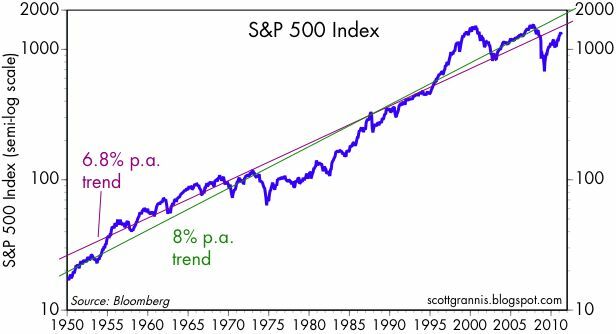 As the third chart shows, equity prices have been recovering to their long-term trends (choose whichever trend growth line you want, the result is the same), but still have a ways to go before raising valuation questions. The equity market has not overshot, and is not overpriced, as I've been arguing for quite some time. We're still climbing walls of worry, and today's worries should not be too difficult to overcome. Equities and property investors have shown nerves of thin glass for a couple of years now. Hard to say I blame them. Obama hasn't helped matters, by talking new federal programs instead of talking a pro-business line. After 9/11 Bush missed a historic opportunity to set this nation towards energy efficiency, and a trimmer government domestically and overseas. He was popular after 9/11, yet as a right-winger he could have made the cuts. Instead we got Iraqistan and Medicare supplements. Obama could have pioneered ground as a pro-business Democrat, who lauded business innovation and a government that tried to help business, not tax or regulate it. The anti-business stance of Democrats is decades out of date (as is the perma-military mobilization stance of Republicans). S&P is correct in the sense that both our parties are deeply wedded to federal spending and their own ossifying rhetoric and partisan coprolite. Hopefully, the private-sector can grow our way past these two parties, both economically and politically.